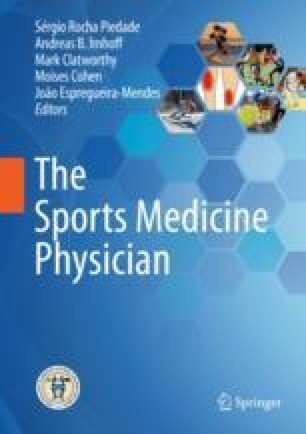 Cutaneous lesions induced by sports are not life-threatening but may have a significant impact on athletic performance and, therefore, need particular attention. Sports practice can be associated with acute or chronic traumatic lesions (blisters, friction dermatitis, callosities, corns, knuckle pads, piezogenic papules) and cutaneous haemorrhage (ball site sign, black heel, subungueal haematoma) often affecting the nails, particularly of the hallux (onychocryptosis, retronychia, nail dystrophy). Athletes are also more prone to environmental aggressions (cold-induced chilblains, urticaria or panniculitis, heat-induced urticaria or erythema ab igne, UV-induced sunburn or photosensitivity), skin infections (tinea gladiatorum, tinea pedis or onychomycosis, bacterial folliculitis, plantar warts, molluscum contagiosum and herpes gladiatorum), allergic contact or photocontact dermatitis due to sports equipment (rubber allergens, footwear, nickel, acetophenone azine from shin guards, etc.) and topical products used to protect or treat skin/muscle-skeletal problems (ketoprofen, UV filters). Moreover, long-term outdoor sports with high sun exposure are associated with an increased risk of skin cancer. Cutaneous lesions induced by sports activities may be mistaken for other cutaneous diseases (black heel, subungueal haematoma), and it is important for the dermatologist to inquire about such practices. The dermatologist may have an important intervention in the prevention, early recognition and therapy of cutaneous diseases induced by sports activities and, therefore, improve athletics performance and allow individuals to enjoy sports without skin lesions. Sakata Y, Ushigami T, Anzawa K, Mochizuki T. Molecular epidemiology of Trichophyton tonsurans, the causative dermatophyte of the epidemic of tinea gladiatorum in Japan between 2011 and 2015. Jpn J Infect Dis. 2018;71:140–4. https://www.jstage.jst.go.jp/article/yoken/advpub/0/advpub_JJID.2017.449/_article.